I recently published a post about survival Spanish for traveling, which is full of useful words and phrases that will help you get by in Spanish-speaking countries. I actually just finished up a trip where I was able to put my survival Spanish to the test. Recientemente, viajé a Costa Rica (I recently traveled to Costa Rica). In this post, I’d like to share a bit about my experience viajando en Costa Rica (traveling in Costa Rica). Costa Rica es muy hermosa! Viajamos a Costa Rica por dos semanas y media (We traveled to Costa Rica for two and a half weeks). In that time, we visited San Jose, Uvita, Manuel Antonio, and La Fortuna. This gave us a nice mix, as we were able to spend time in la ciudad (the city), la playa (the beach), and las montañas (the mountains). For such a small country, Costa Rica really packs a punch! If you’re really motivated, it’s possible to see all three in just a few days. Solo tuvimos una noche en la capital (We only had one night in the capital). It seems as if most travelers to Costa Rica breeze through the city or skip it entirely by heading from the airport straight to another destination. Personally, I enjoy visiting big cities. I’ve had a great time in places like Mexico City, Lima, and Santiago. That being said, I can see why many travelers would rather skip over places like San Jose. San José tiene muchos problemas urbanos, por ejemplo el tráfico, la contaminación del aire y el crimen (San Jose has many urban problems, for example traffic, air pollution, and crime). No wonder so many people skip it entirely and head straight for the beach. Street art in San Jose. I didn’t get to see much of San Jose, but I did a quick walk around our hostel to see a bit of the city. I saw the Parque National (National Park), Museo Nacional de Costa Rica (National Museum of Costa Rica), and a lot of arte callejero (street art). The museum was already closed, but it looks really nice from the outside! Although we didn’t get to know the city very well, it was our first introduction to la comida costarricense (Costa Rican food). For dinner, we really enjoyed trying chifrijo. Después de San José, viajamos a Uvita para un festival de música (After San Jose, we traveled to Uvita for a music festival). Actually, Envision is much more than a music festival. There are also lots of yoga classes and workshops on topics such as permaculture, spirituality, herbal medicine, and more. Tengo una amiga que fue artista en el festival (I have a friend who was an artist in the festival). She worked in the art gallery, which was full of really amazing artwork. There were even live painters all throughout the festival, so we got to see their vision come to life. While the festival itself was great, we really enjoyed going to the beach each afternoon to watch el atardecer (the sunset). Not only was it beautiful swimming in the ocean watching the sun go down, but there were drum circles, fire spinners, and people howling and chanting. There were even people skydiving and landing right on the beach! La música iba hasta el amanecer cada noche (The music went until sunrise every night). We never made it that far, though, as we usually went to sleep around 3 or 4AM. That’s late enough for me these days! Manuel Antonio es uno de los lugares más populares para visitar en Costa Rica (Manuel Antonio is one of the most popular places to visit in Costa Rica). 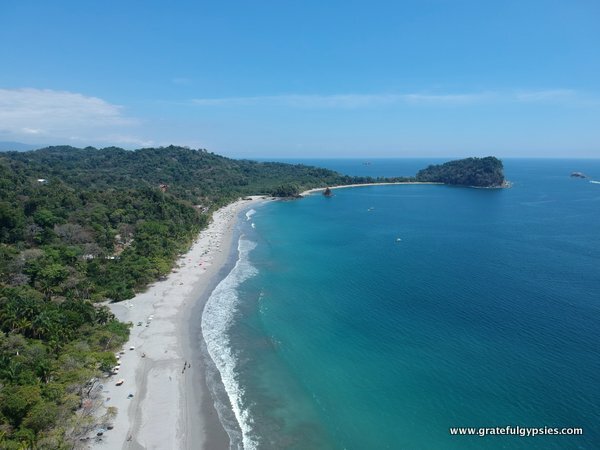 That’s because of the Manuel Antonio National Park that’s located here. After Envision, we headed there for a few days of relaxing and exploring. The town of Quepos is where many travelers arrive, as it’s where you’ll find the bus station. Most locals live here, so there are plenty of shops, banks, restaurants, and so on. There’s a windy mountain road that goes from Quepos to the town of Manuel Antonio and all the way down to the park. We stayed somewhere in the middle at a nice Airbnb place with a pool. After the festival, we needed a few days of el descanso y la relajación (rest and relaxation). Actually, we didn’t end up visiting the park at all. You see, in high season it is incredibly crowded. You have to line up at 6:30 and maybe wait up to two hours just to buy tickets. Even then, you’re not guaranteed entrance to the park, as they limit the amount of people who can go in each day. I also read that you see way more people than wildlife, so we decided to make our own tour. Instead of going to the park, we just headed to Playa Biesanz. It’s called the “Hidden Beach,” but it’s really not that hidden. You just follow a trail down from the main road to get there. It didn’t take long for us to spot some wildlife. Up in the trees, we saw perezosos y monos congos (sloths and howler monkeys). Esta playa es muy bonita y tranquila (This beach is very beautiful and peaceful). We rented a SUP (stand up paddle board) and enjoyed a nice paddle around the bay and then just chilled out for a while. You can also rent kayaks and snorkeling equipment here. Hay muchos restaurantes con una bella vista (There are many restaurants with a beautiful view). Each night, we enjoyed getting drinks and snacks while watching the sunset. We decided to skip having our meals at the touristy restaurants, though. Who comes to Costa Rica to eat pizza and burgers? Instead, we mostly ate in the sodas. I’m not talking about Coke or Sprite, though. In Costa Rica, a soda is a local restaurant. This is where most Ticos (as people from Costa Rica are called) go to eat. The most common thing to order is a casado. Comida tipica en Costa Rica. Basically, you get a piece of meat or fish along with rice, beans, plantains, and a salad. It’s cheap, filling, and tasty! They also gave us eight (yes, eight!) drinks each, snacks, and a delicious dinner. Oh yeah and we also saw plenty of delfines (dolphins) swimming out in the sea! Finally, we headed up into the mountains to visit the town of La Fortuna. La Fortuna tiene volcanes, cascadas, un hermoso lago y mucho más (La Fortuna has volcanoes, waterfalls, a beautiful lake, and much more). It’s also known as the adventure capital of Central America, as you can go hiking, mountain biking, rafting, canyoning, kayaking, and ATV riding, for starters. In the main park of La Fortuna. We had a whole week in La Fortuna, but we had to spend the first few days working. Such is the life of nómadas digitales (digital nomads). Thankfully we had a nice Airbnb place to work from, and we also signed up for the co-working space at the Selina hostel, where we got to enjoy their pool and their river views. One night, I heard a bunch of commotion going on outside and went to have a look. Había muchos vaqueros y caballos en la calle (There were many cowboys and horses in the street). It was basically a big cowboy fiesta and it was tons of fun! There was also a fair going on, full of carnival rides and snacks. They had a bar, live music, and there was even a rodeo! I had never been to a rodeo in my life, so I really enjoyed it. Experiencing local festivals is one of my favorite things about traveling, and this was another great one. With our last few days in La Fortuna, we got to go on some pretty amazing tours. First up, we went on the combination tour with Jacamar. Caminamos alrededor del volcán y nadamos en la cascada (We hiked around the volcano and swam in the waterfall). After that, we headed to Mistico – a park famous for its puentes colgantes (hanging bridges). It’s a really amazing park where you get great views walking across the bridges. There’s also a lot of wildlife out here as well. We even spotted the jacamar bird that the tour company is named after! Thanks to the volcanoes in the area, La Fortuna is home to several aguas termales (hot springs). We finished up the long day with a relaxing soak in the hot thermal waters, which was super relaxing! On our last day, we went on a tour with Desafio called Peddle & Paddle. First up was a bit of bicicleta de montaña (mountain biking). Along the way, we got to enjoy views of the beautiful Arenal Lake. We also spotted several birds and monkeys on the trail thanks to our awesome guide. After the bike ride, we snacked on some fresh piñas (pineapples). Actually, Costa Rica is a huge supplier of pineapples. Did you know that 2 out of every 3 pineapples traded internationally comes from Costa Rica? They also make some pretty amazing coffee here! A short boat ride took us out on the lake where we got to do some more SUPing. It’s quickly becoming one of my favorite activities, as it’s fun and pretty good exercise. Although it had been an overcast and rainy day, the sun finally came out and the volcano poked its head out of the clouds for a bit so we could snap a few photos. What a beautiful place to SUP! All in all, we had an amazing time in Costa Rica. It’s a beautiful country with such a diverse range of landscapes and so much wildlife. The people are really friendly, and the tourism industry here runs like a well-oiled machine. There’s so much more to see and do in Costa Rica that we’re already planning our return trip! ¿Has visitado Costa Rica? ¿Dónde fuiste? ¿Como estuvo tu viaje? Have you visited Costa Rica? Where did you go? How was your trip?